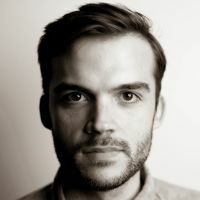 According to the paper's editor-in-chief Gerard Biard, who was in London when the gunmen attacked, there was "no particular tension at the moment" and no specific threats of violence. 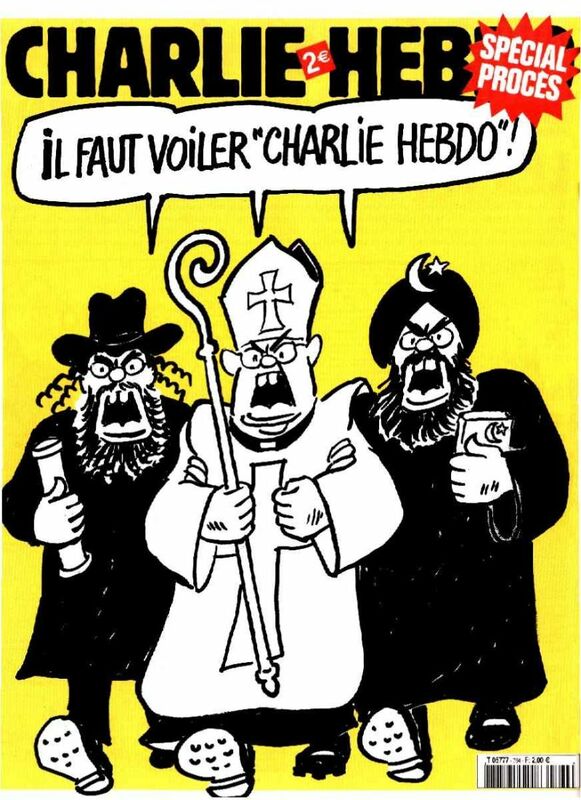 But Charlie Hebdo has been a target for a long time, thanks to a long history of intentionally controversial and provocative cartoons and covers. First founded in 1970 when its predecessor was shut down by the French government (for making fun of Charles de Gaulle—more below), then again in 1992 after ten years out of print, Charlie Hebdo is like a more gleefully and pointedly offensive politically conscious French Mad magazine (with which it shares an affection for vulgarity and distaste for subtlety). 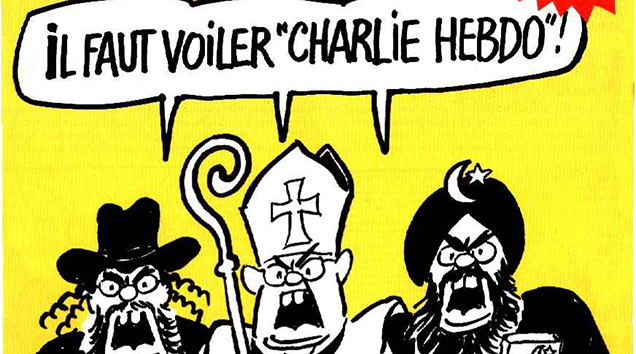 Charlie's stance is vocally left, anti-authoritarian, anti-religious, and anti-institutional, but it tends to get the most attention when it undertakes one of its yearly-or-so projects illustrating Muhammad cartoons. 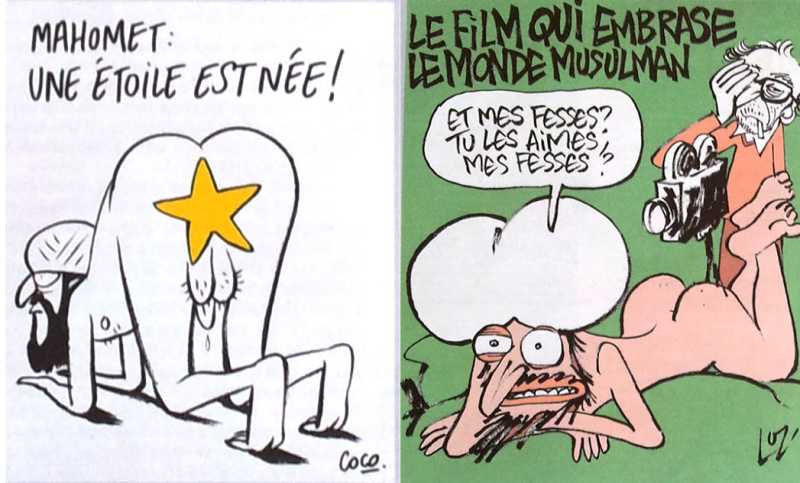 In October 2011, Charlie Hebdo published an issue "guest-edited" by Muhammad and rebranded Sharia Hebdo. 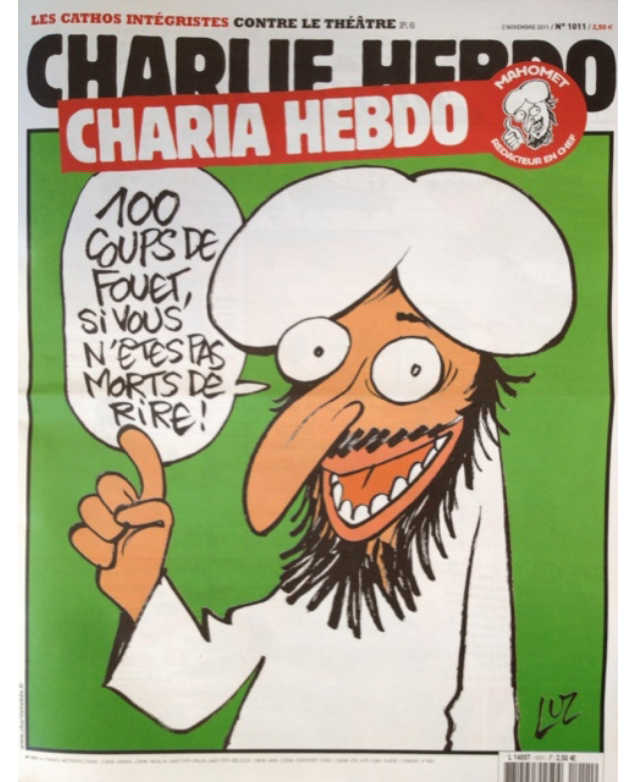 The cover featured a cartoon (by the cartoonist Luz) of the prophet telling readers "100 lashes if you don't die laughing." The cover parodied the French film The Intouchables ("a cloying tale of a rich white man who, paralyzed in a paragliding accident, hires a poor black man to care for him"). 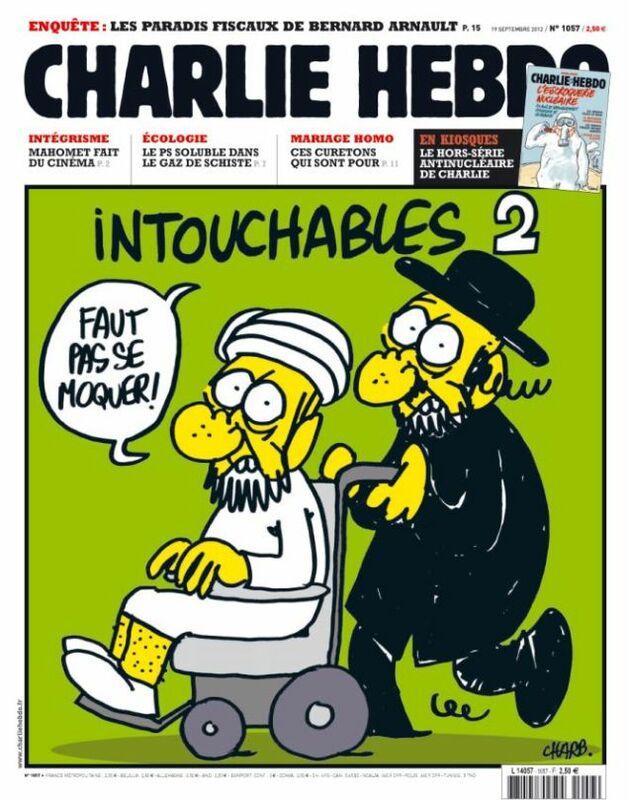 The Muslim and the Jew are saying "we can't be mocked!" Immediately, the French government increased security and announced its decision to close the twenty foreign outposts last Friday, which was a Muslim day of prayer. French Prime Minister Jean-Marc Ayrault issued a statement criticizing the cartoons and any such "excess." 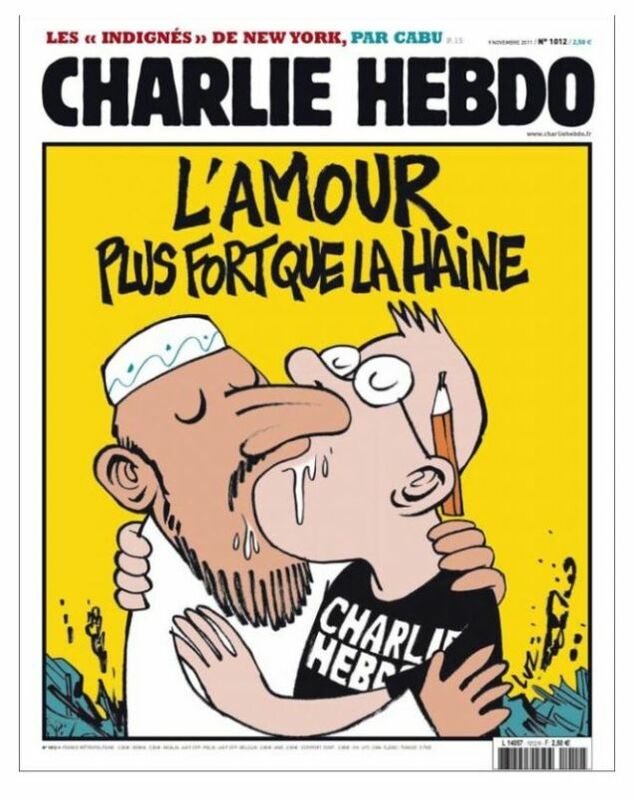 Politicians and editorial pages in much of France attacked the drawings as irresponsible, inopportune, and imbecilic. 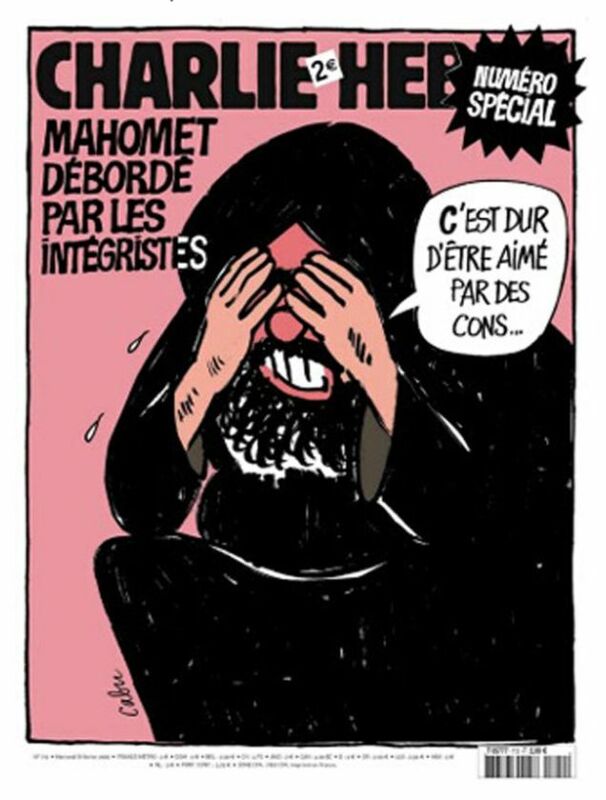 In 2006, five years before the firebombing, Charlie republished the infamous Danish Jyllands-Posten cartoons of Muhammad, adding some of its own and giving the issue a cover with the headline "Muhammad overwhelmed by fundamentalists," and a cartoon of the prophet crying and saying "It's hard to be loved by dicks"
French president Jacques Chirac condemned the magazine, and a group of Muslim organizations sued, saying the cartoons were racist. The suit was dismissed. The young man, Siné wrote without a shred of evidence, was planning to convert to Judaism before marrying Jessica Sebaoun-Darty, the Jewish heiress of a huge electronics chain. 'He'll go a long way in life, this lad!' Siné commented. The piece was published without controversy - until several days later, when a radio presenter referred to it as anti-Semitic. The families of those concerned were said to be 'sickened'. Val, who took the controversial decision to re-publish a Danish newspaper's cartoons of the Prophet Mohammed two years ago in the name of freedom of the press, agreed that the piece was offensive and told its author to apologise. Siné refused, saying he would rather 'cut his own nuts off' and was, more or less, fired. 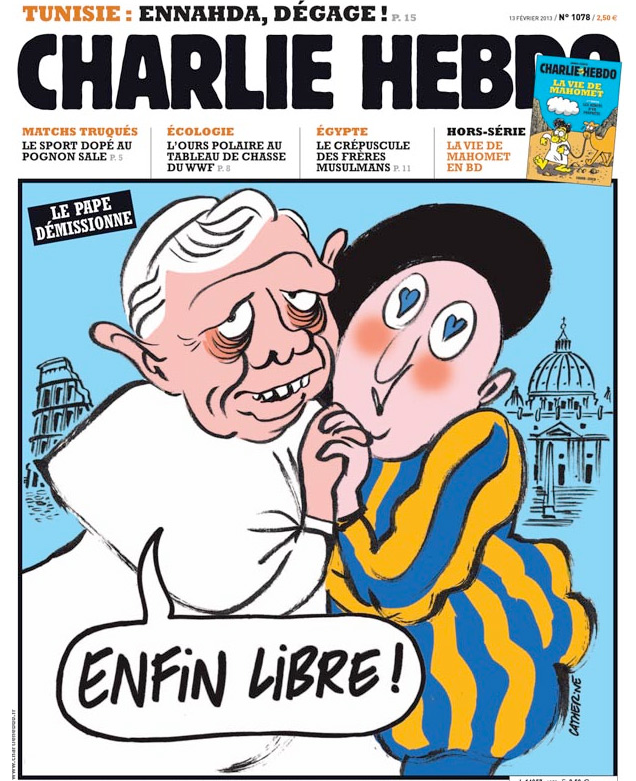 Siné won a 40,000-Euro judgment in his suit and went on to launch his own magazine, Siné Hebdo. Two dramatic events were dominating the news: a terrible fire at a discotheque which killed more than 100 people; and the death of former President Gen Charles de Gaulle. 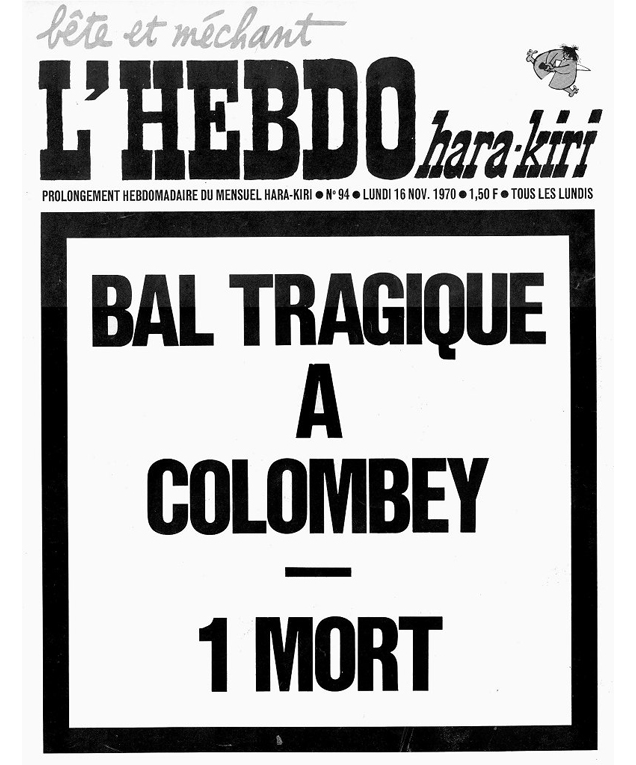 Hara-Kiri led its edition with a headline mocking the General's death: "Bal tragique a Colombey - un mort", meaning "Tragic dance at Colombey [de Gaulle's home] - one dead." The subsequent scandal led to Hara-Kiri being banned. 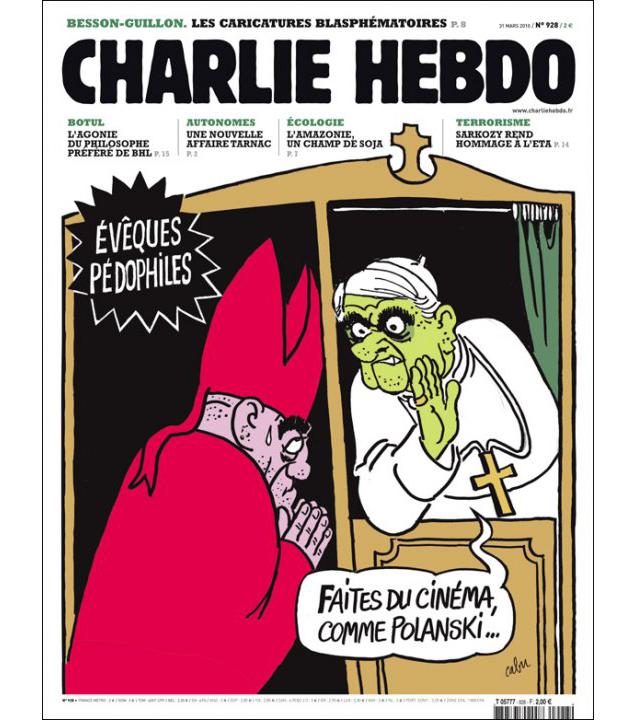 To which its journalists promptly responded by setting up a new weekly - Charlie Hebdo. The Charlie was not an irreverent reference to Charles de Gaulle, but to the fact that originally it also re-printed the Charlie Brown cartoon from the United States.